What is undeniable is that the Lib Dems are being taken very seriously by both Labour and Conservatives in a way that has not happened for a long time. 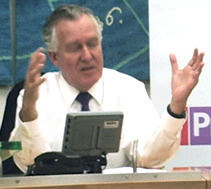 Peter Hain wrote a comment piece for The Guardian last Friday in which he called for a new era of co-operation between the Lib Dems and Labour. It follows a number of occasions when the Tories have also tried to “love bomb” Lib Dem supporters (examples here and here). “Millions see themselves, not as dyed-in-the-wool Labour supporters, but as progressives who may also vote Lib Dem or Green or, in Wales, Plaid Cymru. I am not asking them to sign up to Labour’s entire record, but Lib Dem supporters and others can use their votes tactically, especially in seats where Labour is locked in a two-way battle with Tories enjoying multimillion-pound backing from tax exile Lord Ashcroft. Hain was also a guest on Andrew Marr’s BBC show yesterday morning where he continued along this theme and encouraged Lib Dem supporters in Labour/Tory marginals to vote Labour tactically to keep the Tories out. Tony Blair used a similar tactic in 2005. The problem that Hain faces however with this sort of call is how disenfranchising it is. A vote for Labour is a vote for Labour. After 2005, the Lib Dems were still on the outside trying to influence policy in spite of the fact that if Blair’s and Hain’s calls are followed through to their logical conclusion some of the government’s vote was “borrowed” from the Lib Dems to keep the Tories out. To be fair to Hain, he is a long term advocate of the Alternative Vote which would make this sort of tactical voting unneccessary but we are currently faced with the existing system. Marr pursued Hain on this point of tactical voting and asked him whether Labour voters in seats where the Lib Dems are best placed to take the seat should also switch tactically. He of course was not willing to go this far, Labour politicians are not allowed to advocate voting for anyone other than a Labour candidate if one is standing (a rule that most parties have to be fair). We can only assume that this is a tacit call for that to happen given the constraints he is under. I have been unable to find any Lib Dem blogosphere response to Hain’s calls so far. Perhaps that is the best summary of how Lib Dems generally feel about this. They have heard it all before. Is Hain genuinely thinking about a close working relationship between Labour and Lib Dems or just simply trying to poach their voters? The historical evidence would suggest the latter. What is undeniable is that the Lib Dems and their supporters are being taken very seriously by both Labour and Conservatives in a way that has not happened for a long time. I must say I think Labour and the Lib Dems are getting a bit closer to each other.